The standard Sogetsu Textbooks, which consist of “Sogetsu Textbook 1&2” and “Sogetsu Textbook 3&4”, are used in the lessons. They cover all the necessary basics for beginners to enjoy acquiring skills through actual interaction with flowers, deepen their understanding of the plant materials, and eventually master a high level of self-expression through flowers. 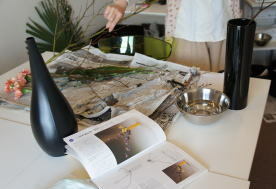 copyright©2012 - Kuroyanagi IKEBANA School - all rights reserved.